Three pods of Southern Resident Killer Whales (Orcas) spend the late spring, summer, fall and early winter in Juan de Fuca Strait, Haro Strait, Boundary Pass and southern Georgia Strait. 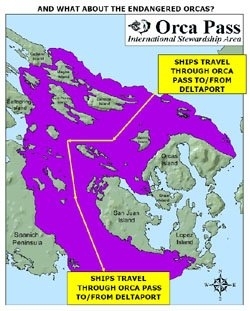 Both the US and Canadian governments acknowledge that this area, often called Orca Pass, is critical habitat for this endangered group of Orcas. They spend much time traveling, feeding and resting along the western shore of the San Juan Island. There is a sanctuary area for the orcas that excludes powered whale-watching vessels. 2. Too much noise from commercial vessel traffic. Both these threats become much worse if Roberts Bank Container Terminal 2 (RBT2) is built. RBT2 has negative impacts on juvenile salmon. RBT2 will see significant increases in number of container vessels passing through the Orca habitat. Sound pressure waves mapped for a large commercial ship in Haro Strait sends continuous, loud sounds to the east through the sanctuary shoreline of San Juan Island and various other San Juan islands and west to the shores of Vancouver Island and the Gulf Islands. The sound waves coming from the ships bounce off the islands, echoing the loud continuous noise, disrupting communications between these magnificent creatures. Large ships emit sounds in the range of 160 to 210 dB. The Recovery Strategy for the endangered Southern Resident Orcas says: "sounds in excess of 160 dB have the potential to disrupt marine mammal behaviour, and sounds in excess of 180 dB may cause physical injury". Given this information, it's astonishing that governments are allowing this to happen! As well as acoustic pollution, these vessels also pollute the air all through Orca Pass, so on calm days there is a thick yellow-orange haze that settles through the area. On such occasions, this and other pollutants are added to the sea-surface micro layer that the orcas have to move through as they breathe. Join us in protecting our Endangered Species.